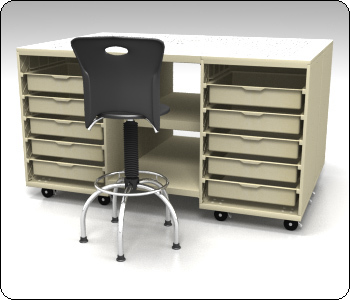 We have put two of our 4-drawer units together with a 22" wide shelf to make the perfect sit-down sewing station usable with a regular sewing chair for anyone who prefers the lower height. 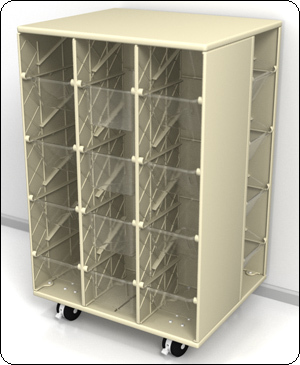 Add a third unit to create a 30" high Sew & Serge station similar to our 67021. (Sewing machine not included). Comes completely assembled. Ships via truck. Call for shipping costs. When space is really tight this 22" x 66" combination takes up just slightly more room than an ironing board but gives you a sit-down space for your sewing machine, and 10 spacious drawers for storage. 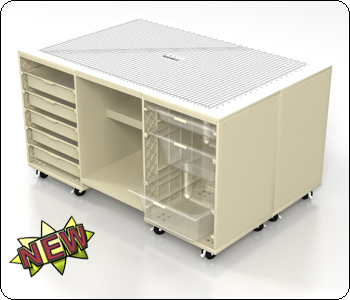 Replace that bulky sewing desk and cardboard boxes with this mobile unit. A gridded mat (not included, see last page for mats) would transform the surface to a cutting table. Use a 30" adjustable chair (purchased elsewhere) to sit up to the table for sewing, crafting, scrapbooking, etc. Weight: 150 lbs. Ships via truck. Some simple assembly required. Call for shipping costs. 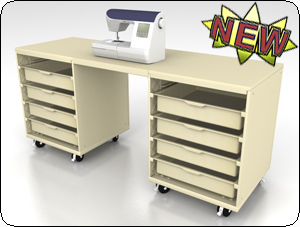 Three units connected in L-shape with kneehole shelves make an ideal Sew 'n Serge Station to shift your sewing time into high gear. Use with a 30" high stool (purchased elsewhere) and simply turn from one machine to the other for those stitch/serge/stitch/serge construction details. Caddies (accessory item S6910) not included. Weight: 220 lbs. Ships via truck. Some simple assembly required. Call for shipping costs. 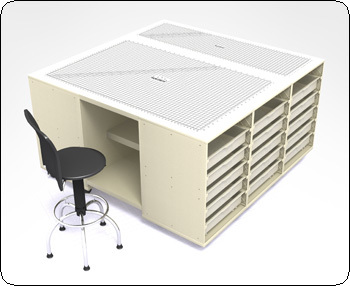 30 storage drawers and a 44x66" gridded rotary cutting mat combine to make this the ULTIMATE CUTTING/.CRAFT TABLE. 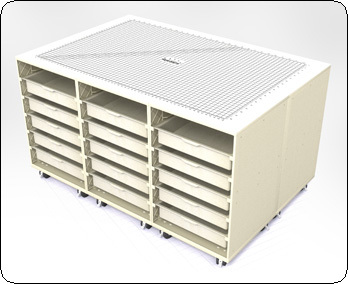 Modular units are shipped completely assembled, bolts & nuts are included for joining units together. Each module rides on sturdy 3" casters, front are locking, back are not. When you’re ready for a real "workhorse" for your sewing room, this is it. Note: Top surface is not designed for direct use with a rotary cutter. Protect table surface with a cutting mat (pictured). Mat included with this table. Weight: 360 lbs. Ships via truck. Some simple assembly required. Call for shipping costs. Four Sew-Brite modular units and six 22" wide shelves makes a 44" x 66" table. Gridded mat included. Ships via truck. Some simple assembly required. Call for shipping costs. Four drawer units combined with full shelves in one side and sit down space on other side. 44" x 66" mat included. Five drawer units with a sit down space. 44" x 66" mat included. Three 5-drawer units and one Clear Tub unit combined with full shelves on one side and a sit down space on the other side. 44" x 66" mat included. 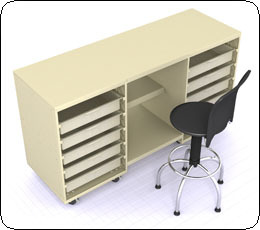 Four 5-drawer units and one Clear Tub unit combined with a sit down space. 44" x 66" mat included. A massive 66" x 66" surface on a table with six drawer units and full shelves down the middle. Two mats included (one 44" x 66", and one 22" x 66" for full coverage). Same as 67069 (above) except one side has sit-down space. Same size as 67069 except sit-down spaces on all four sides. Great for when the girls get together. 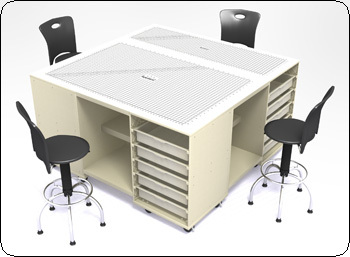 For the truly space conscious, we have combined a 44" x 66" full table sit-down combination (see 67541) with a sewing "L" to give you space for both a sewing machine and a serger. A real workhorse for the sewing room. This 7-drawer unit and 3 sit-down shelf sections combine to make a very workable arrangement. Sew and surge on the "L" and sit up to the 44" x 66" matted cutting surface to do handwork. 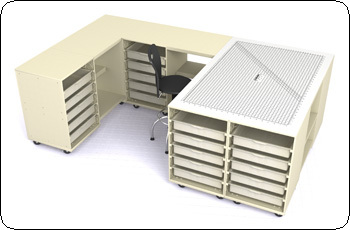 This combination gives you a massive 66" x 66" matted cutting area with shelves through the center and a Sew & Surge "L" for the ultimate sewing center. 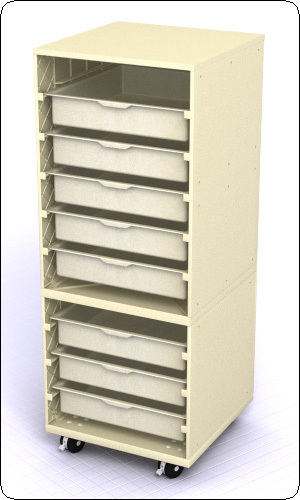 Nine drawer units give you 45 drawers for fabric and notions. 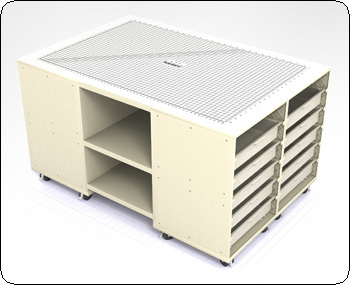 Two full-length 22" x 66" shelves will hold bolted fabrics or storage boxes. 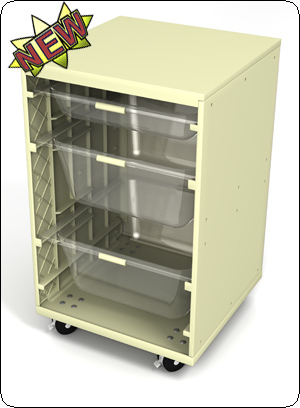 Single modular unit measures 22" x 22" x 36" high with 5 Mega-Tray drawers, four 3" casters, locking on front and non-locking on back. 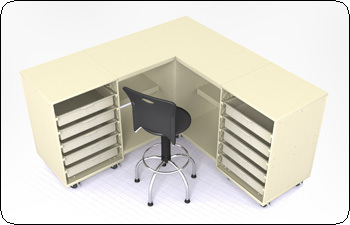 These can be combined in any configuration to build the workstation you desire, or use alone for storage. The six unit configuration 67006 (price: $2576.95) is made up of six of these 'Building Blocks'. 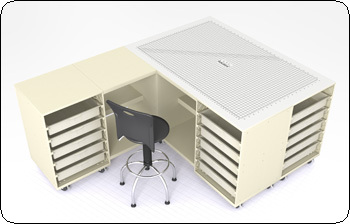 Being modular, this makes it possible to build a cutting/storage table that will suit your space needs. Weight: 65 lbs. Comes completely assembled. Call for shipping costs. Two 9" deep and one 4" deep clear-view trays with handles. 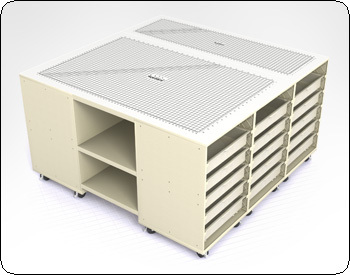 Can be attached to our 67001 5 Mega-Tray storage unit. Easy to clean. 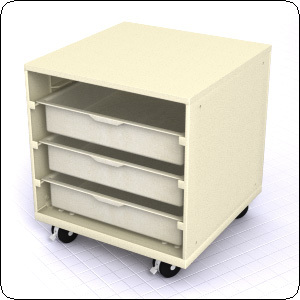 Very mobile with two 3" heavy-duty locking and two non-locking casters. 22"x22"x36"H. Available in sandstone color. 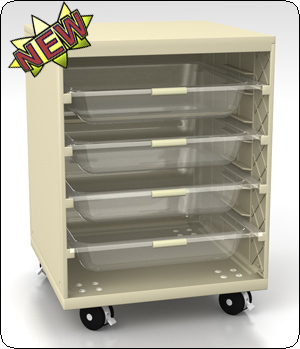 We’ve stacked two of our new clear tub units to create the ultimate storage tower. Measures 22"wide x 22" deep x 69" high, riding easily on 3"casters. 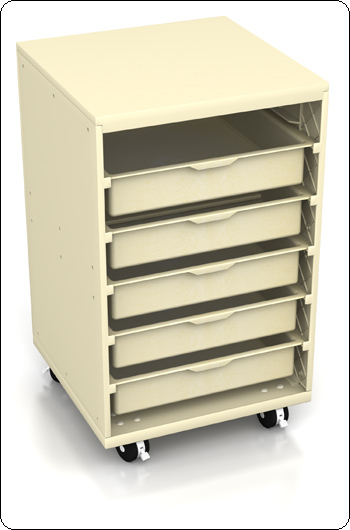 A shorter version with 3 Mega-Tray drawers, just 24" high. 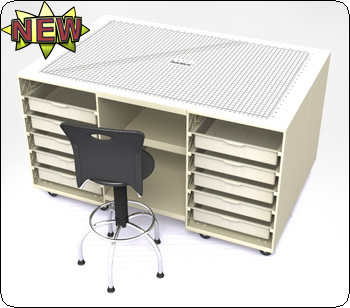 Great as a chairside "table" with storage or anywhere that the 5-drawer unit won’t fit. Durable 3" casters. Weight: 55 lbs. Comes completely assembled. Call for shipping costs. 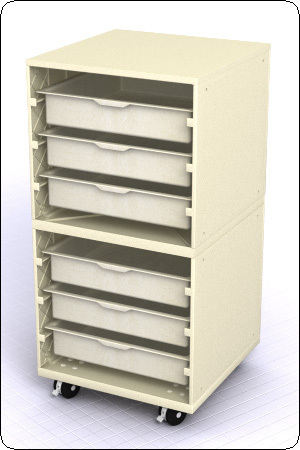 Two 3-drawer units permanently stacked to make a 6-drawer storage unit 22"x22"x44"H.
Weight: 120 lbs. Comes completely assembled. Call for shipping costs. 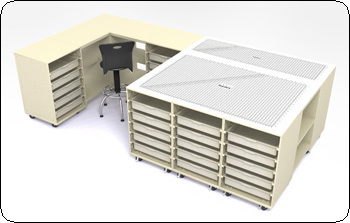 Massive storage for the floor space in this combination of the 5-drawer and 3-drawer units permanently joined together, 22"x22"x56"H.
10 drawer storage units give you maximum storage area for the floor space. 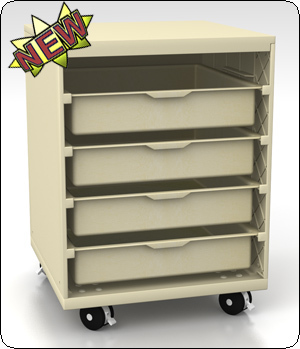 22"x22"x69"H.
Our new 4-drawer unit is 30" high with the same 22-wide x 22-deep footprint, rolling easily on sturdy 3" casters. Use it anywhere the 36" size is too tall (in a closet, under a shelf, etc.). Also available with four 1226DPH Drip Pans with handles (67004CL). 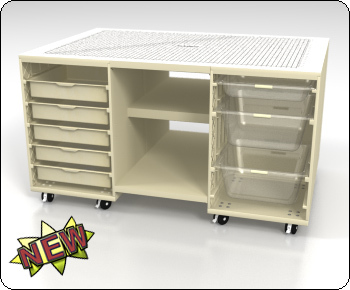 Our new 4-clear-drip-pan unit is 30" high with the same 22-wide x 22-deep footprint, rolling easily on sturdy 3" casters. Use it anywhere the 36" size is too tall (in a closet, under a shelf, etc.). Designed to be placed against your wall, with a storage combination that will provide you with plenty of storage. The frame is sturdy and rolls on (4) 3" heavy duty casters. The 2-way runner system is great for easy access to your supplies. Ships via truck. Call for shipping costs. Comes fully assembled.